É possível usar fontes de dados locais e criar relatórios e dashboards do Power BI usando um gateway.You can use on-premises data sources, and create Power BI reports and dashboards, using a gateway. 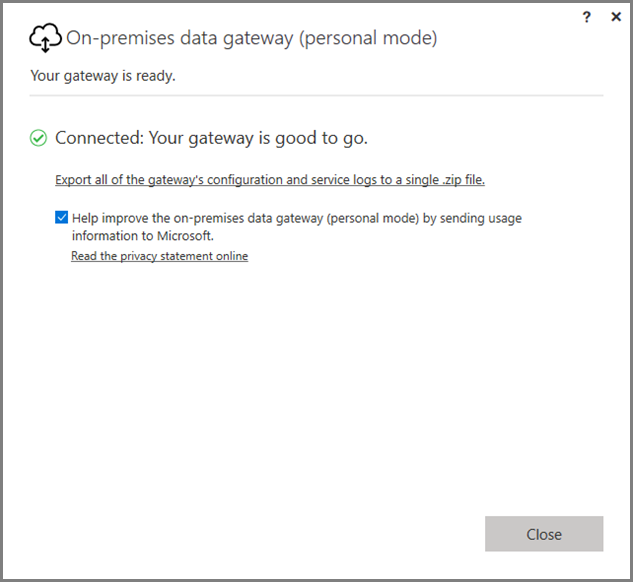 Um gateway é um software que facilita o acesso a dados armazenados em uma rede privada local e permite que você use esses dados em serviços online, como o Serviço do Power BI.A gateway is software that facilitates access to data that is stored on a private, on-premises network, then enables you to use that data in online services like the Power BI service. 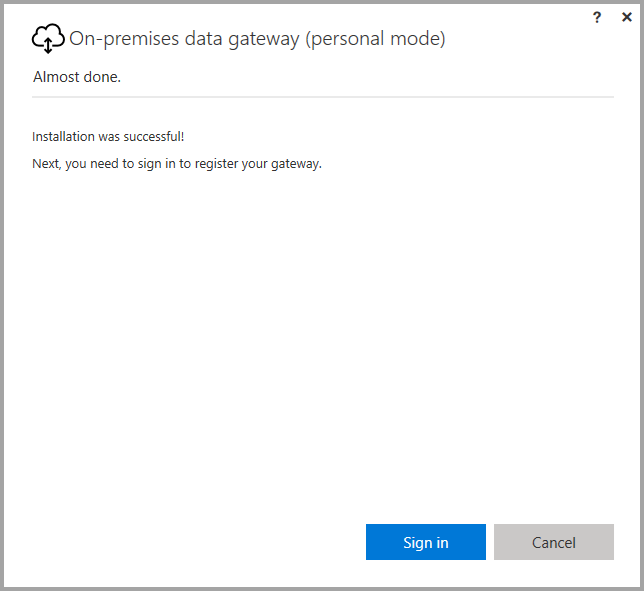 O Gateway de dados local (modo pessoal) é uma atualização lançada recentemente do Gateway do Power BI, que permite que os usuários instalem um gateway em seu próprio computador e tenham acesso a dados locais.The On-premises data gateway (personal mode) is a recently released update to the Power BI gateway that allows individuals to install a gateway on their own computer, and gain access to on-premises data. 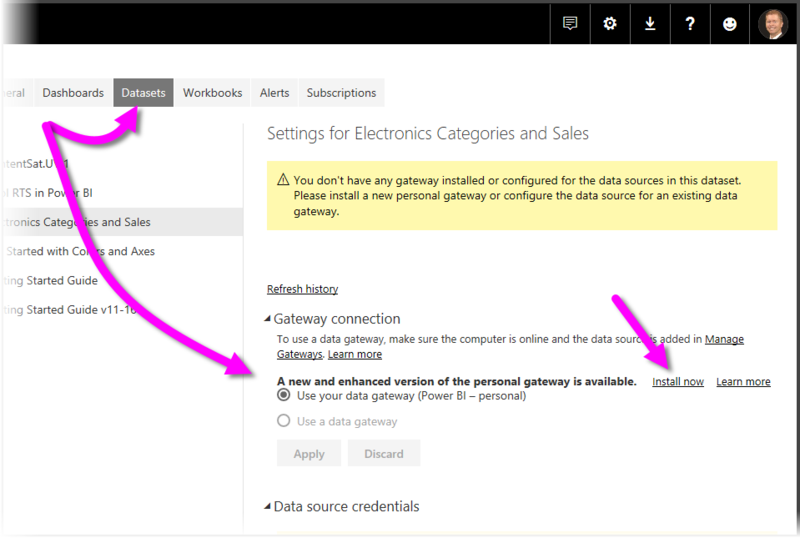 O Gateway de dados local (modo pessoal) substitui a versão anterior compatível do gateway pessoal, chamada Power BI Gateway – Personal.The On-premises data gateway (personal mode) replaces the previously supported version of the personal gateway, which is called Power BI Gateway - Personal. O gateway pessoal anterior continuará funcionando apenas até 31 de julho de 2017.The previous personal gateway will continue working only until July 31, 2017. Consulte as seções abaixo para obter informações sobre como atualizar para a nova versão.See the sections below for information on how to update to the new version. Maior confiabilidade – a nova versão do gateway pessoal aumentou a confiabilidade com relação à versão anterior, devido a melhorias no software estrutural e no código.Improved reliability - the new version of the personal gateway has improved reliability over the previous version, due to code and structural software improvements. Extensibilidade avançada – como parte das melhorias no software estrutural, recursos adicionais poderão ser adicionados facilmente ao gateway pessoal assim que se tornarem disponíveis.Enhanced extensibility - as part of the structural software improvements, additional features can easily be added to the personal gateway as they become available. Excluir o gateway pessoal do serviço do Power BI – com a nova versão, agora você pode excluir seu gateway pessoal de dentro do serviço do Power BI.Delete personal gateway from the Power BI service - with the new version, you can now delete your personal gateway from within the Power BI service. Logs de configuração e serviço – a nova versão permite que você exporte facilmente logs de configuração e serviço para um arquivo .zip, com um único clique.Configuration and service logs - the new version lets you easily export configuration and service logs to a .zip file, with a single click. Para instalar o Gateway de dados local (modo pessoal) sem ter a versão anterior do gateway instalada, selecione o ícone de engrenagem no serviço do Power BI e selecione Gateway de Dados.To install the On-premises data gateway (personal mode) without having the previous version of the gateway installed, select the gear icon in the Power BI service and select Data Gateway. Também é possível baixar o gateway neste local.You can also download the gateway from this location. Você pode seguir as etapas de instalação e, como o processo de instalação permite que você instale qualquer uma das versões do gateway (o gateway padrão, que pode ser compartilhado com outras pessoas ou o modo pessoal), certifique-se de selecionar Gateway de dados local (modo pessoal) quando for perguntado qual versão do gateway você deseja instalar.You can follow the installation steps, and since the installation process allows you to install either version of the gateway (the standard gateway, which can be shared with others, or personal mode), make sure you select On-premises data gateway (personal mode) when prompted for which version of the gateway you want to install. 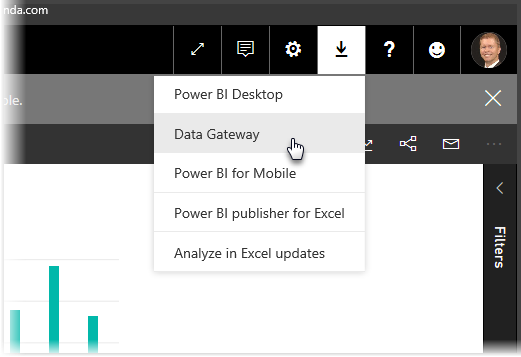 Se você já tiver o Power BI Gateway – Personal instalado, será solicitado que você instale a nova versão aprimorada do gateway pessoal quando você exibir Conjuntos de Dados em Configurações no serviço do Power BI.If you already have the Power BI Gateway - personal gateway installed, you'll be prompted to install the new and enhanced version of the personal gateway when you view Datasets under Settings in the Power BI service. Quando selecionar um conjunto de dados e, em seguida, selecionar Conexão de Gateway, você será notificado de que uma versão nova e aprimorada do gateway pessoal está disponível.When you select a dataset, and then select Gateway connection you're notified that the new and enhanced version of the personal gateway is available. Quando isso acontecer, selecione Instalar agora.When you do, select Install now. Se você estiver executando a versão anterior do Power BI Gateway – personal como um processo com privilégios elevados, certifique-se de iniciar o processo de instalação do novo gateway com privilégios elevados também, para que as credenciais de seu conjunto de dados possam ser atualizadas automaticamente.If you're running the previous version of Power BI Gateway - personal as an elevated process, make sure you start the new gateway installation process elevated as well, so your dataset credentials can be automatically updated. Caso contrário, você precisará atualizar as credenciais do conjunto de dados manualmente.Otherwise, you'll have to update dataset credentials manually. Você percorrerá o processo de atualização, após o qual verá que a instalação foi bem-sucedida.You'll be taken through the update process, after which you'll see that the installation was successful. Não feche as coisas ainda, há uma última etapa.Don't close things out yet, there's one last step. Esta é a última etapa.Here's the last step. Depois que o novo gateway pessoal estiver instalado (com a última tela de instalação ainda visível), entre no serviço do Power BI e aguarde até ver que o gateway está online, conforme mostrado na imagem a seguir.Once the new personal gateway is installed (and the last installation screen still visible), sign in to the Power BI service, and wait until you see that the gateway is online, as shown in the following image. Se você tiver atualizado o gateway pessoal no mesmo computador em que o gateway anterior foi instalado, suas credenciais serão atualizadas automaticamente e todas as atividades de atualização passarão pelo novo gateway.If you've updated the personal gateway on the same machine as the previous gateway is installed, your credentials will update automatically, and all refresh activities will go through the new gateway. Se o gateway anterior tiver sido instalado em um computador diferente, você precisará atualizar suas credenciais em determinados conjuntos de dados.If the previous gateway was installed on a different machine, you'll be asked to update your credentials on certain datasets. Na imagem anterior, observe a lista de conjuntos de dados na janela. A lista mostrará conjuntos de dados que podem exigir credenciais atualizadas.In the previous image, notice the list of datasets in the window; the list will show datasets that might require updated credentials. Cada conjunto de dados listado é um link direto no qual basta você clicar para atualizar suas credenciais com facilidade.Each dataset listed is a direct link that you simply click on to easily update your credentials. É isso... quase.That's it - almost. Com o novo gateway instalado, você não precisa mais da versão anterior instalada em seu computador, portanto, você deve desinstalá-la.With the new gateway installed, you no longer need to previous version installed on your machine, so you should uninstall it. Você pode fazer pesquisando pelo Power BI Gateway – Personal em seu computador e desinstalando-o.You can do this by searching for Power BI Gateway - personal on your machine, and uninstalling it. 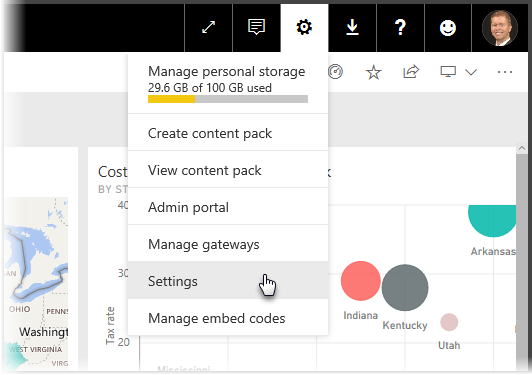 A versão anterior do gateway pessoal se chama Power BI Gateway – Personal e usa o ícone do Power BI em sua caixa de diálogo de instalação.The previous version of the personal gateway is called Power BI Gateway - Personal and uses the Power BI icon in its installation dialog. A nova versão do gateway pessoal é chamada gateway de dados local (modo pessoal) e usa o ícone de gateway (uma nuvem com uma seta para cima e para baixo na parte inferior).The new version of the personal gateway is called On-premises data gateway (personal mode) and uses the gateway icon (a cloud with an up-and-down arrow along the bottom). Você pode ir até Adicionar/Remover Programas e ver se Power BI Gateway – Personal aparece na lista e, se sim, você tem a versão anterior do gateway pessoal instalada.You can go to Add/Remove Programs and see whether Power BI Gateway - Personal appears on the list, and if so, you have the previous version of the personal gateway installed. Uma vez concluída, a configuração entrará em vigor em aproximadamente um minuto.Once complete, the setting will take effect in approximately one minute. Para verificar se ela está funcionando corretamente, tente fazer uma atualização sob demanda no serviço do Power BI para confirmar se a Combinação Rápida está funcionando.To check that it's working properly, try an on-demand refresh in the Power BI service to confirm that Fast Combine is working. Há algumas coisas a levar em consideração ao usar o Gateway de dados local (modo pessoal), conforme descrito na lista a seguir.There are a few things to consider when using the On-premises data gateway (personal mode), as described in the following list. A conta de usuário que você selecionou não corresponde aos requisitos do aplicativo. Use uma conta diferente.The user account you selected does not match the requirements of the application. Please use a different account. Para corrigir esse erro, selecione Usar uma conta diferente e entre novamente.To remedy that error, select Use a different account and sign in again. O suporte para Spark está planejado para o segundo semestre do ano civil de 2017.Support for Spark is planned for the second half of the 2017 calendar year. É possível executar o Gateway de dados local (modo pessoal) lado a lado com o Gateway de dados local (anteriormente conhecido como a versão Enterprise do gateway)?Can I run the On-premises data gateway (personal mode) side by side with the On-premises data gateway (previously known as the Enterprise version of the gateway)? Resposta: Sim, com a nova versão, ambos podem ser executados simultaneamente.Answer: Yes, with the new version, both can run simultaneously. É possível executar o Gateway de dados local (modo pessoal) como um serviço?Can I run the On-premises data gateway (personal mode) as a service? Resposta: Não.Answer: No. O Gateway de dados local (modo pessoal) só pode ser executado como um aplicativo.the On-premises data gateway (personal mode) can only run as an application. Se precisar executar o gateway como um serviço e/ou no modo admin, você precisará considerar o Gateway de dados local (anteriormente conhecido como gateway Enterprise).If you need to run the gateway as a service and/or in admin mode, you'll need to consider the On-premises data gateway (previously known as the Enterprise gateway). Com que frequência o Gateway de dados local (modo pessoal) é atualizado?How often is the On-premises data gateway (personal mode) updated? Resposta: Planejamos atualizar o gateway pessoal mensalmente.Answer: We plan to update the personal gateway monthly. Por que estou solicitado a atualizar minhas credenciais?Why am I asked to update my credentials? Resposta: Muitas situações podem acionar uma solicitação de credenciais.Answer: Many situations can trigger a request for credentials. 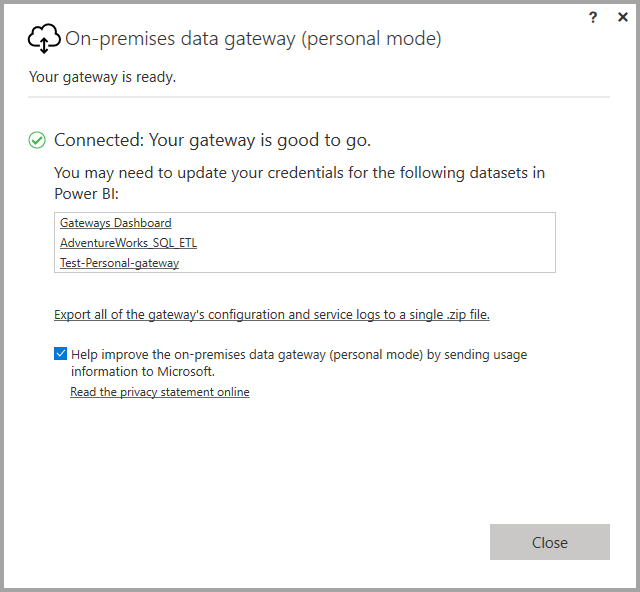 A mais comum é você ter reinstalado o Gateway de dados local (modo pessoal) em um computador diferente de seu gateway do Power BI – pessoal.The most common is that you've re-installed the On-premises data gateway (personal mode) on a different machine than your Power BI - personal gateway. Também pode haver um problema na fonte de dados e o Power BI não conseguiu realizar uma conexão de teste ou ocorreu um erro de tempo limite ou do sistema.It could also be an issue in the data source, and Power BI failed to perform a test connection, or a timeout or a system error occurred. Você pode atualizar suas credenciais no serviço do Power BI indo até o ícone de engrenagem, selecionando Configurações e, em seguida, Conjuntos de Dados e localizando o conjunto de dados em questão e clicando em atualizar credenciais.You can update your credentials in the Power BI service by going to the gear icon and selecting Settings then Datasets, and finding the dataset in question and clicking on update credentials. Quanto tempo meu gateway pessoal anterior ficará offline durante a atualização?How much time will my previous personal gateway be offline during the upgrade? Resposta: Atualizar o gateway pessoal para a nova versão deve levar apenas alguns minutos.Answer: Upgrading the personal gateway to the new version should only take few minutes. O que acontece se eu não migrar para o novo gateway pessoal até 31 de julho de 2017?What happens if I don't migrate to the new personal gateway by July 31st, 2017? Resposta: Se você estiver atualizando seus relatórios com o gateway atual, as atualizações serão interrompidas.Answer: If you’re refreshing your reports with the current gateway, your refreshes will stop. A única maneira de configurar uma nova agenda de atualização será instalando e configurando o novo gateway.The only way to set up a new refresh schedule will be by installing and configuring the new gateway. Estou usando o script do R.I'm using R script. Ele tem suporte?Is that supported? Resposta: Os scripts R têm suporte para o modo pessoal.Answer: R scripts are supported for personal mode. Por que não estou vendo a mensagem para atualizar meu gateway no serviço do Power BI?Why am I not seeing the message to update my gateway in the Power BI service? Resposta: Provavelmente, isso está acontecendo porque você tem um ou mais conjuntos de dados que incluem uma fonte de dados que ainda não tem suporte.Answer: Most likely, this is because you have one or more datasets that include a data source that is still currently not supported.